Hear directly from distributors on the content they are producing and the types of projects they look for, plus a get a glimpse of content they have in their pipelines. Abigail Disney and Fork Films have been a major force in funding documentary films. Hear her thoughts on what stories are the most important to tell. Open to all badge holders on first-come basis. 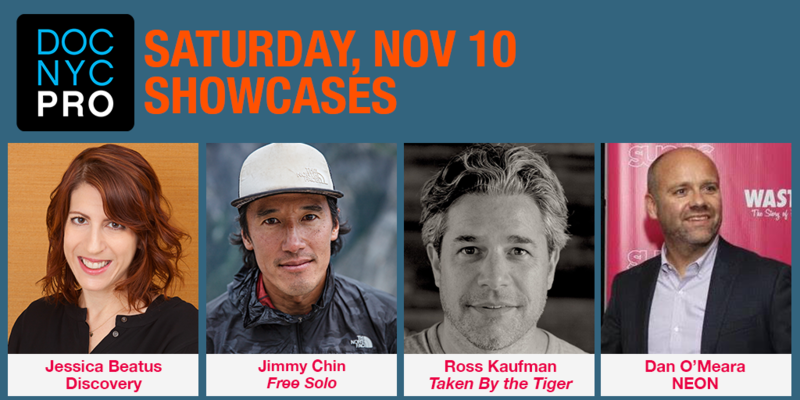 Join the filmmaking team from Taken By The Tiger, including director Ross Kaufman and Discovery’s Jon Bardin and Jessica Beatus, as they take an in-depth look at the film and Discovery’s Project C.A.T. initiative; moderated by Kristi Jacobson (Take Back the Harbor). Join Neon executives Dan O’Meara and Elissa Federoff as they discuss turning Three Identical Strangers into a hit, what NEON looks for in the acquisitions market and how it has quickly established itself as a force in the distribution world. Topic Studios develops, produces and finances documentaries, feature films, shorts, podcasts and series for all screens. Hear Topic executives Anna Holmes, Jihan Robinson and Jeff Seelbach, along with some of the creative partners they have worked with – including Nadia Hallgren (She’s the Ticket), Darius Clark Monroe (Black 14) and Dan Taberski (Missing Richard Simmons) – as they discuss how they approach storytelling, development and the different types of projects Topic is seeking out.